Aemilia Lepida is the name of several ancient Roman women belonging to the gens Aemilia. The name was given to daughters of men belonging to the Lepidus branch of the Aemilius family. The first Aemilia Lepida to be mentioned by Roman historians was the former fiancée of the younger Cato. Subsequent Aemiliae are known because of their marriages. When he thought that he was old enough to marry,— and up to that time he had consorted with no woman,— he engaged himself to Lepida, who had formerly been betrothed to Metellus Scipio, but was now free, since Scipio had rejected her and the betrothal had been broken. However, before the marriage Scipio changed his mind again, and by dint of every effort got the maid. Cato was greatly exasperated and inflamed by this, and attempted to go to law about it; but his friends prevented this, and so, in his rage and youthful fervour, he betook himself to iambic verse, and heaped much scornful abuse upon Scipio, adopting the bitter tone of Archilochus, but avoiding his license and puerility. Lepida and Cato were first cousins with Lepida's father and Cato's mother being blood siblings. Aemilia Lepida was a Roman noble woman who lived in the 1st century BC. She was the first wife of Lucius Cornelius Sulla Faustus, who was consul in 5 BC. She bore him several children including her son, suffect consul of 31, Faustus Cornelius Sulla Lucullus. One of her daughters-in-law was Domitia Lepida a great niece of Emperor Augustus and a granddaughter of triumvir Mark Antony. One of her grandchildren was consul Faustus Cornelius Sulla Felix. Aemilia Lepida may have been the name of the wife of Gnaeus Domitius Ahenobarbus (consul 32 BC), due to the name of Ahenobarbus's granddaughter, Domitia Lepida. Her only child was her son Lucius Domitius Ahenobarbus (consul 16 BC). Her son married Antonia Major, a niece of Roman Emperor Augustus and a daughter to Augustus' sister Octavia Minor and Mark Antony. Their children were Domitia Lepida the Elder, Gnaeus Domitius Ahenobarbus (consul 32) and Domitia Lepida the Younger. Aemilia died before 31 BC. Aemilia Lepida (4/3 BC – ?) was the daughter of Lucius Aemilius Paullus and his wife Julia the Younger. She was the first great-grandchild of the Emperor Augustus, and at one time was a fiancée of the future Emperor Claudius. Lepida had several children with her husband, Marcus Junius Silanus, and two of her sons became consuls. Aemilia Lepida was the daughter to Lepidus the Younger and sister to Manius Aemilius Lepidus. She married the wealthy Roman Governor Publius Sulpicius Quirinius. In her younger years, she was engaged to Emperor Augustus’ heir Lucius Caesar. She had borne a daughter to senator Mamercus Aemilius Scaurus. In 20, she was charged with adultery, poisoning, consulting astrologers, falsely to claim to bear a son to her ex-husband and attempting to poison her ex-husband. At her trial her brother defended her. During her trial, the Games were held. Other distinguished ladies, accompanied her into the theatre and protested her innocence to Emperor Tiberius. She was found guilty and was exiled. Aemilia Lepida (died 36) was daughter of Marcus Aemilius Lepidus, consul in 6 and niece to the consul Lucius Aemilius Paullus (executed 14 AD). Despite her uncle's disgrace, and due to her father's high standing with the Roman emperors and the Senate, she married her second cousin Drusus Caesar. Tacitus reports that during their marriage "she had pursued her husband with ceaseless accusations". In 36, she was charged with adultery with a slave and committed suicide, "since there was no question about her guilt" (Annals 6.40). Aemilia Lepida was daughter of Manius Aemilius Lepidus, consul in AD 11. This Aemilia Lepida is usually identified with Lepida, wife of the short-lived Roman Emperor Galba. She bore him two sons before her death. She died relatively young, and their sons also died young. Galba never remarried. 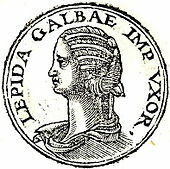 When Lepida lived, Agrippina the Younger (a widow after Gnaeus Domitius Ahenobarbus' death) tried to make shameless advances to Galba who was devoted to his wife and thus completely uninterested. On one occasion Lepida's mother gave Agrippina the Younger, while in the company of a whole bevy of married women, a public reprimand and slapped her in the face. ^ Barrett, Anthony, 'Caligula: The Corruption of Power' (Touchstone, 1989), p. 122. ^ Tacitus, Ann. 3.22–23; Suetonius, Twelve Caesars: "Tiberius" 49.1. ^ a b Suetonius, Twelve Caesars: "Galba".